Recent years have seen renewed interest in the World War II battlefields of Northwest Europe with the fiftieth anniversary of the Normandy landings in particular sparking a surge in tourism. As the D-Day veterans age, many want to revisit the scenes of what was often the most intense and dramatic period in their lives. The “Good War” is now far enough away in time to evoke the more purely historical appeal of Gettysburg or Waterloo. Whatever brings readers to Normandy’s beaches and bocage, they’ll find this book indispensable. A chapter on “Getting There” presents key travel facts for visitors arriving from North America or the U.K., as well as lists of dozens of museums and tourist offices, complete with addresses and telephone numbers. Seven main sections address the various sectors of the battlefield; each offers a concise narrative of events that’s both colorful and complete—despite the text’s relative brevity, it will be a rare veteran who doesn’t recognize some familiar scene or character. Featuring plenty of photographs (both WWII-era and modern) and sidebars presenting memorable eyewitness quotes, these historical sections make for interesting, informative reading and dovetail smoothly with the “Circuits” that follow, designed to offer about a day’s worth of activity and include all the major sites, memorials, and museums of a given area. A map and clear, precise directions lead the visitor to particular points of interest mentioned in the text. A typical circuit begins at St. Mere Eglise, runs the length of Utah Beach, then heads up the Cotentin peninsula to Cherbourg; others cover the remaining assault beaches and the glider and paratroop drop zones. Interlink Books publishes a series of similar historically oriented guides to countries and cities, and they’ve learned to do it right. The text is a fine, economical blend of military accuracy and vivid anecdote; the tourism-related material is complete without being overwhelming; the maps are easy to read, if a bit spartan, and a bibliography, a glossary, and an Order of Battle round out a competent package. Perhaps the only quibble is size: at 51/4 “ x 8“ it’s handy but not really pocket-sized. 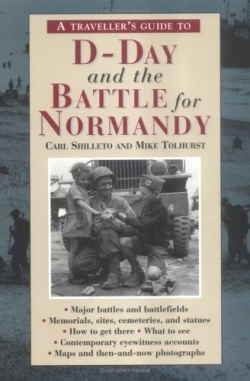 For anyone contemplating such a trip or looking for a readable general account of the Normandy battles—this is an excellent, well-executed resource. For veterans of other European battles, there is a companion volume on the Battle of the Bulge, and Interlink expects to release more titles. If they live up to the standard set by this Traveller’s Guide, historically minded tourists will have much to look forward to.